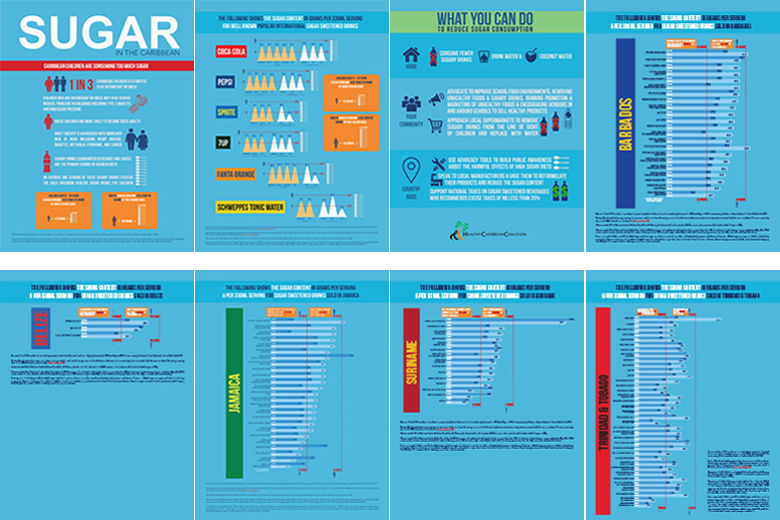 On the 6th October 2016 we launched an infographic on the sugar content of popular sugar sweetened beverages in the Caribbean. The consumption of sugar sweetened beverages (SSBs) is one of the major contributors to the obesity epidemic among adults and children. In the Caribbean on average data shows that 1 in 3 children is overweight or obese. The sugar content of one serving of most popular carbonated beverages and juices far exceeds the entire daily healthy maximum sugar intake for adults and children as recommended by the WHO and the American Heart Association (AHA). As promised we have produced a suite of infographics with regional, international and country specific data and information. The infographics are available in two versions digital, for electronic distribution and also print friendly versions.